Heat oil in a heavy based saucepan over medium-high heat. Add curry paste and fry until it begins to deepen in colour and release the oil, approximately 6-8 minutes. Add palm sugar and fish sauce, stirring until dissolved. Add coconut milk, chicken stock and kaffir lime leaves and bring to the boil. Reduce heat and simmer for approximately 15 minutes to thicken and intensify flavour. Adjust seasoning to taste with sugar, fish sauce and lime juice. Prepare a bamboo steamer over boiling water and steam Barramundi fillets for 8-10 minutes. Season with salt. In a food processor add lemon juice, lime juice, palm sugar, ginger, garlic and fish sauce and blitz until combined. Adjust to taste. Strain. Dress herbs just before serving. 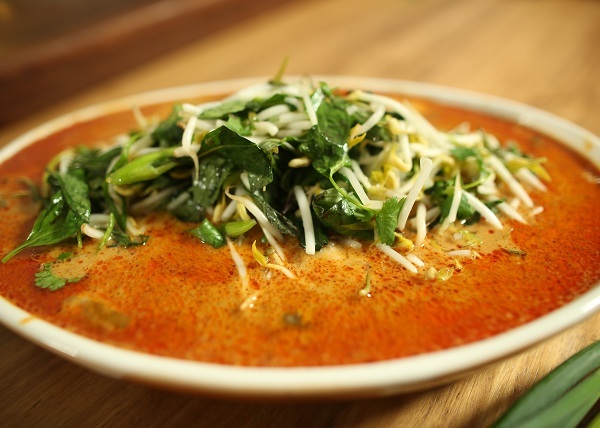 To serve, place red curry sauce on the base of bowl, add Barramundi fillet and top with dressed herbs.